Perth will have a second Airbus A380 operator from May 1 2018 when Qatar Airways upgauges its existing daily service from Doha to the world’s largest passenger aircraft. Currently, the oneworld alliance member serves Perth from its Doha hub with Boeing 777-300ERs. The change to the A380, which is configured with eight first, 48 business and 461 economy seats for a total of 517 seats, represented a 44 per cent lift in capacity for Qatar Airways to Perth. 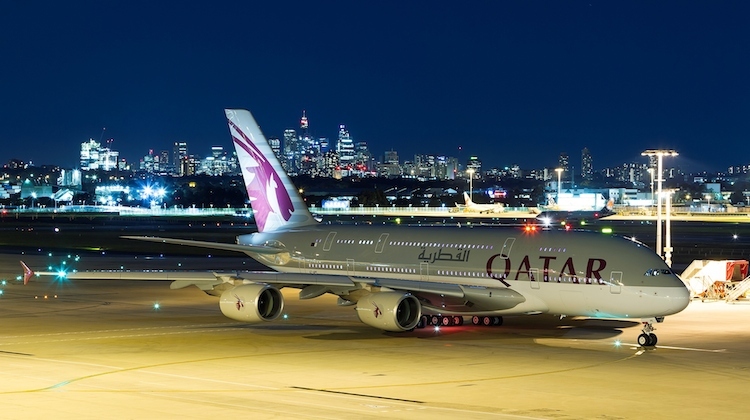 Qatar senior manager for Australasia Adam Radwanski said the decision to bring the A380 onto the Perth-Doha route reflected passenger demand. “We have seen continued demand and increased appetite for travel among the Western Australian market since we started flying this route in July 2012,” Radwanski said. Perth will be the second Australian A380 destination for Qatar Airways, which started using the aircraft on its daily Doha-Sydney rotation in September 2016. It also flies to Adelaide and Melbourne, as well as Auckland in New Zealand. From February 2018, Qatar will commence a new daily Doha-Sydney-Canberra service with Boeing 777-300ER equipment. Qatar first flew to Perth in July 2012, first with Boeing 777-200LRs and then the larger 777-300ER. The airline is unable to add any additional frequencies to the four major Australian gateways of Brisbane, Melbourne, Perth and Sydney as it has utilised all available capacity for Qatari flag carriers under the current bilateral air services agreement between Australia and Qatar. Perth will be 3rd A380 desrtination for QR. They already operate this type on SYD and MEL. If Qatar airways can’t serve Brisbane, why can’t they just fly to the GoldCoast on their 787’s or a350’s? Doesn’t Perth have 1 x A380 capable gate? Great news as bilateral agreement updates between the two countries are long overdue. This is completely consistent with Qatar’s intention of building route success to markets where others don’t. This A380 news is great for WA first class demand. Congratulations to Qatar. A really good airline. I have flown on their A350’s and they are stunning. The A380 is wonderful and will catalise growth. Congrats to my home city of Perth. It is more of an honour to have an airline other than Emirates (101 A380s) operates there’s to Perth. QATAR Airways, so much better than the now terrible snooty and cabin crew lazy Emirates. Have flown three round trips to the UK with QR, great service on the truly comfy B777 so not sure why you would utilise the A380 on this service, however, time will tell. Have also completed three round trips on EK, never again, lazy and rude cabin crew. The Doha hub is bright and pleasant and easy to navigate through. Yes there is only one A380 equipped bridge at PER so not sure how that will work as QR and EK run parallel in the evening. Maybe EK will drop their non filling A380 and revert to the B777, that would solve the problem nicely..sorted ! Geoff Here. Gates 150 and 151 are both A380 available MARS facilities so no issues with two code F aircraft there concurrently. Roll on new ITB pier structure. Looks great. Qatar have been growing steadily with healthy demand. Hence their new A380 service from 1 May 2018. Singapore will be next to upgrade ex PER to the A350 as they imminently move to more than 20 aircraft ops. Their maintenance of 4 frequencies per day will be sustainable with even lower seat/ mile costs. The A 350 has enormous pax appeal also. Hi Geoff, yes the A350 is lovely to fly in, have been on it with SQ three times this year already SIN/MAN and MAN/SIN X 2. Very fortunate as have had 4 trips on the 787 as well 2x NZ; , 1 x QR and 1 by AVIANCA COLOMBIA. OK look forward then to seeing the QR 380 here. …an aside about the a380. With the coming of the Boom Mach 2.2, 45 seat passenger liner aimed at the Business Class market I wonder if this will prompt the building of the 1000 series and 1,000 passenger version of the a380. If subsonic jets lose their business class passengers to the Boom will airbus not consider making an all economy version of the a380 to carry as many passenger as they can? The a380 may yet come into its own. Bad timing saw the passing over of the DC 5 and the termination of the 757 before it really came into demand???????? ?